Successfully Added Flexible Roll Up Synthesizer Keyboard Piano with Soft Keys to your Shopping Cart. 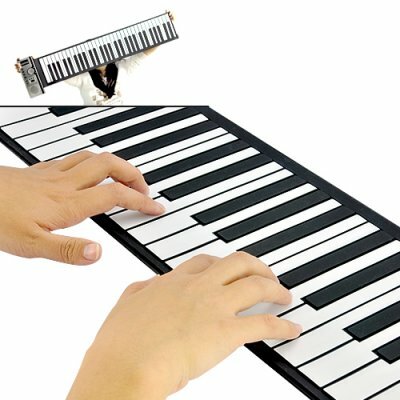 Practice and show off your piano skills at any time with this Flexible Roll Up Synthesizer Keyboard Piano. Popular worldwide due to its compact size and plentiful functions, take this soft keyboard piano with you anywhere you go! Play with this Flexible Roll Up Synthesizer Keyboard Piano at any time and any place. The soft keys are made from silicon-rubber, allowing it to be folded, bent, wrapped, and rolled without damage. It can be stored easily in your handbag and carrying case so you can take it with you everywhere and lay down a few chords whenever you want. A headphone jack is also available, allowing you to play and practice without disturbing people near you. This Flexible Roll Up Synthesizer Keyboard Piano is especially great for musicians on the go, brand new piano students, or even as a gift to your child to foster his/her interest in music. With 61 standard layout piano keys, 128 different synthesized tones to choose from, 100 different rhythms to play with, and 40 demo songs available, this portable piano is comparable to any high end digital piano at only a fraction of the price. A perfect gift for the musician in your life or as a profitable resale item, this Flexible Roll Up Synthesizer Keyboard Piano is in stock and ready for your orders now. Order today and we'll express ship it out to you tomorrow. Brought to you by the leader in wholesale electronics and cool gadgets, Chinavasion. Portable piano on the go!